Riding a motorcycle can be a thrilling pastime. However, because motorcycles lack a protective exterior, motorcyclists are more vulnerable to accidents and injuries than other motorists . This sad reality makes taking advantage of essential safety gear—such as motorcycle helmets—even more important. Research from the U.S. Department of Transportation's Fatality Analysis Reporting System (FARS) shows that wearing a motorcycle helmet can reduce the risk of serious head injuries and death by 67 percent and 37 percent, respectively. Unfortunately, not all states mandate the use of motorcycle helmets and, as a result, many motorcyclists choose not to wear them. Choosing to forego the use of a motorcycle helmet can have heartbreaking consequences. In fact, of the 48 people who died in motorcycle accidents in Delaware between 2014 and 2016, nearly half were not wearing a helmet, according to statistics cited by The News Journal in a December 2016 article. If you are a motorcycle enthusiast, here's what you need to know about motorcycle helmet laws in Delaware and beyond. In the United States, motorcycle helmet laws can vary from state to state. Most of these laws fall into one of two categories: universal helmet laws, which mandate helmet use for motorcyclists of all ages and partial helmet laws, which only mandate helmet use for motorcyclists of certain ages. Partial helmet laws are most common, with such laws in place in 28 of the 50 states. Nineteen states have universal helmet laws and three states—Iowa, Illinois, and New Hampshire—have no laws governing the use of motorcycle helmets. Delaware is one of the 28 states with a partial helmet law. Delaware Code Title 21, Section 4185 requires motorcyclists (and motorcycle passengers) age 18 and younger to wear safety helmets and eye protection approved by the Secretary of Safety and Homeland Security through the Delaware Office of Highway Safety whenever “operating or riding on a motorcycle.” Additionally, Delaware state law requires all motorcyclists and passengers to have approved safety helmets and eye protection in their possession when riding a motorcycle—even if they do not choose to use them. Delaware used to be a universal motorcycle helmet state. However, the state repealed its universal helmet law in 1978 and replaced it with the current partial helmet law. A bipartisan group of Delaware lawmakers attempted to pass a new universal motorcycle helmet law in 2015 and again in 2016—citing the burden that the cost of long-term care for motorcycle accident victims with traumatic brain injuries places on taxpayers—but their attempts were unsuccessful. 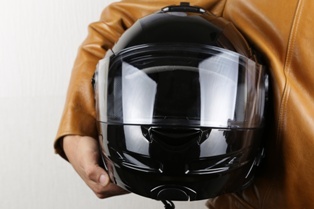 Because Delaware's partial helmet law requires all motorcyclists to carry an approved helmet and eye protection, it is important for Delawareans to know how to select these items—even if they have no intention of actually wearing them. Guidelines from the State of Delaware Office of Highway Safety prohibit motorcyclists from making modifications to their helmet, or using a helmet equipped with speakers that enter or completely block the ear canals. If you were hurt in a motorcycle accident that wasn't your fault, the experienced attorneys with the Morris James Personal Injury Group can help you fight for the financial recovery you need and deserve. Contact the Morris James Personal Injury Group today to schedule an appointment for a free initial case consultation.